The Civilization series of strategy games have been popular since the 90’s, when the original Civilization video game by Sid Meier hit shelves. In these games you pick a civilization (amongst the likes of Australia and Germany) and take it from the Stone Age to the Information Age. In between, you get to take part in diplomacy and war, building cities, roads and research technology in order to get the upper hand over rival civilizations. There’s also a colourful leader representing each civilization (civ for short) in these games, and you get to interact with these characters in the game’s diplomacy screen, working out trade deals and also declaring war on annoying world leaders and other civs from time to time. Like in the earlier games, Civilization VI features superbly animated leaders for each civ, including the likes of Teddy Roosevelt and Montezuma. Also, last year’s Rise and Fall expansion added several new leaders including Robert the Bruce, while this year’s upcoming Gathering Storm expansion will add new personalities to the game including Wilfrid Laurier of Canada and Suleiman of the Ottomans. 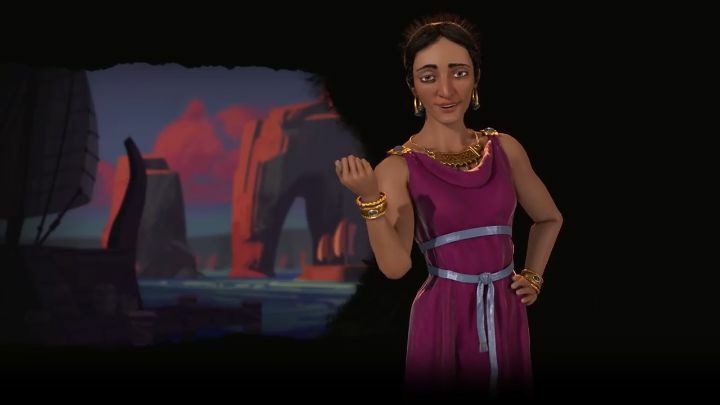 Additionally, developer Firaxis has now revealed that Queen Dido and the Phoenician civilization are coming to Civilization VI in the game’s Gathering Storm expansion too. Phoenicia’s unique district (the “Cothon”) will also help players with maritime ambitions, as it speed ups construction of naval units (and settlers too) in whatever city you choose to build it. Also, should your naval units take damage in battle, know that these will heal within one turn if you’ve built a Cothon in the city and the ship is within the city radius. It’s clear then, that Phoenicia’s advantages truly come into play when you’re playing as this civilization on a coastal or island map. Adding to this is the fact that Phoenicia also gets the bireme, a unique unit which replaces the trireme in the game. This is faster and stronger than the galley and will surely help you dominate the seas early in the game. All in all, it looks like Civilization VI’s Phoenicia civ will be fun to play for both those new to the game, and Civilization veterans too. This is especially true for those who like to settle the coast and rule the seas, and wish for an alternative to civs like Norway and Indonesia in the game. Also, here’s hoping that the upcoming Gathering Storm expansion for Civilization VI really does improve what already is one of the best strategy games made to date too. Note: Civilization VI: Gathering Storm will be released on February 14, 2019. Available on PC.